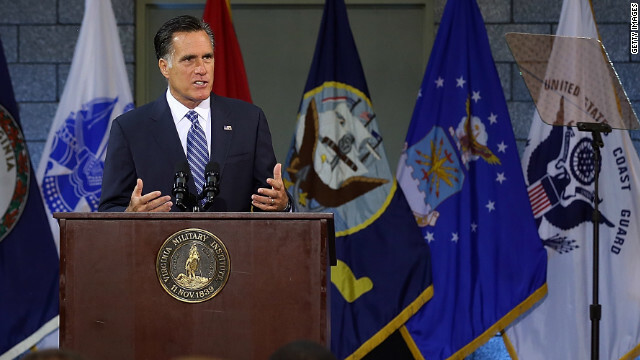 How different are Romney and Obama's foreign policies, really? In a major speech two weeks before he debates President Barack Obama on international issues, Mitt Romney argued that Obama is failing to provide the global leadership needed and expected by the rest of the world. Romney called for the U.S. to join allies in ensuring that rebels fighting government forces loyal to Syrian President Bashar al-Assad get military hardware they seek. He also criticized Obama's overall approach to the Arab Spring uprisings in the Middle East and the Israeli-Palestinian conflict. And he argued that last month's attack on a U.S. diplomatic compound in Benghazi, Libya, that killed U.S. Ambassador Christopher Stevens and three other Americans "was likely the work of the same forces affiliated with those that attacked our homeland on September 11th, 2001." Q: One of the points you've brought up before is that these two candidates really see eye-to-eye on a lot of foreign policy issues. The only one that we really heard that was different was Romney's stance on arming the Syrian rebels. How does the United States go about doing that? ZAKARIA: If you were to have listened to that speech, you would assume, atmospherically, that Romney had very strong disagreements with the Obama administration, but his problem is that Obama has run a foreign policy almost like a moderate Republican. It's been internationalist. It's not been too liberal in the sense of human rights oriented. It's been tough. So the Syrian issue is the one place Romney can find to make a distinction. But as you point out, it's a very difficult policy to enact. The Syrian insurgency is really an uprising of 100 armed militias all over Syria that are not particularly well connected to one another, so you wouldn't know whom you were arming, you wouldn't understand what the goals of the people you are arming is, and there is a danger that some of this would blow back in just the way it did in the Afghan case where the people we armed turned into terrorists. But I would guess that a President Romney would confront many of these same dilemmas and would be quite cautious, which is why, even in his rhetoric, he doesn't say, "We should arm the Syrian rebels." If you read that paragraph of his speech, it's quite convoluted. He says we should work with our allies and make sure that the rebels get the weapons they need, which sounded to me like he's saying, "We should allow the Saudis and the Qataris to provide more assistance, not arm them ourselves." Q: In his speech, Romney implied that the Obama administration was being deceptive, trying to convince us that the attack on the U.S. consulate in Benghazi was a random response to the film that insulted the Prophet Mohammed. ... Has the administration done enough throughout the region to help those countries transition from what we saw as these dictators to now democracy? ZAKARIA: Here you reach at a very, very interesting problem. You could argue that the administration hasn't done enough, but what you would be arguing then is that the administration, the U.S. administration, should provide more assistance to the newly elected democratic governments in, say, Egypt and Tunisia, which are Islamist. These elections were won by people who think of themselves as kind of followers of a kind of political Islam. Now, many people in the conservative movement in the U.S. despise these people and regard them as forces that we should be battling. So Romney has a very difficult agenda, where he wants to criticize Obama for not helping make Egypt successful democratically, but does he really mean that we should be supporting these groups in which many believe in some kind of sharia law and such? Should we be supporting these groups more? I doubt that that is a place that conservatives would be comfortable. And Romney, as a result, even there is a little bit vague. Other than saying that Obama has done it wrong, he doesn't really tell us specifically what he would do. Q: Let's talk a little bit about Iran. David Sanger of "The New York Times" writes in August that "despite increasingly painful sanctions, and a covert program called Olympic Games that aimed to show the Iranian program with cyberattacks, Iran has made substantial progress in producing enriched uranium in recent years from about one bomb's worth when Mr. Obama took office in 2009 to the equivalent of about five bombs worth today." We recently saw the Israeli prime minister, Benjamin Netanyahu, draw this very clear red line before the U.N. Is there any daylight between these two candidates when it comes to how tough they're going to get on Iran? ZAKARIA: Not really. Look, the truth of the matter is, it's important to understand that Iran has a very extensive civilian nuclear program. And when you talk about one war bombs' worth or five bombs worth, this is not bombs. This is the amount of uranium they have that could be converted were this to become a military program. I would argue, and I think this is generally speaking and experts would agree, the Obama administration has been very tough on Iran. The sanctions are global. They are crippling. They are hurting them. But the truth is, Iran is one of the world's great petroleum exporters. They have money. The nuclear weapons program doesn't cost that much. So the only thing you can realistically do beyond this would be to bomb Iran. And the issue is not will the sanctions be able to somehow physically stop the Iranians from pursuing the nuclear energy program or a weapons program. The question is, will it bring them to the negotiating table because they feel the pain is so crippling, because they feel their economy is in a death spiral. That's where the pressure is going to act. The pressure isn't going to suddenly shut down their ability to produce nuclear energy. Q: You often refer to the foreign policy crisis we're seeing now as "their" problem, not something that the U.S. can mitigate necessarily with our edicts or speeches, but it's really something that is born of an issue there. It is something that is their angst, not necessarily because of us. ZAKARIA: I think you'd see this most with regard to the Arab Spring. Romney says we should be much more aggressive on the Arab Spring in shaping it. Well, you know, that's going to be very difficult. What's going on in Egypt and Tunisia - it really is about them, not about us. And you can say the Obama people should have been more assertive here or less assertive there. The truth is this is a world historical change taking place in the Middle East. We're bystanders. We're well-wishers. There isn't much we can do, which is why when Romney is asked for specifics on what he would do in Egypt or even Libya, he says he would work with the government of Libya to find the guys that murdered our ambassador. Well, obviously that's what the Obama administration is doing. – Fareed Zakaria: After Benghazi, is al-Qaeda back?